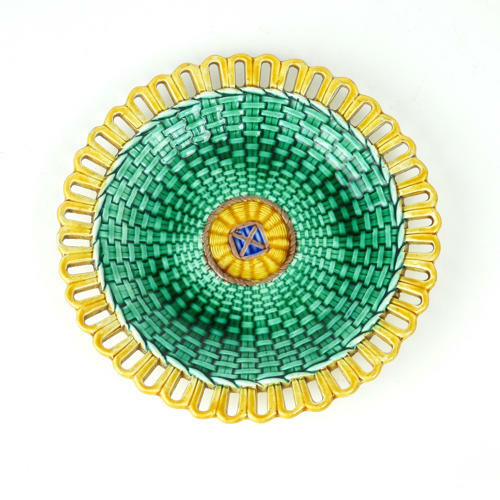 A small, Wedgwood majolica plate with a pierced border. This piece has an impressed 'WEDGWOOD' mark and it is also impressed with the letters 'E' and 'W'. It dates from c.1870 and it is in perfect condition. The border is pierced with an arcaded design and the centre of the plate is moulded with a basket weave design. It is coloured with green, blue, brown and ochre coloured majolica glazes and the overall effect is very attractive.